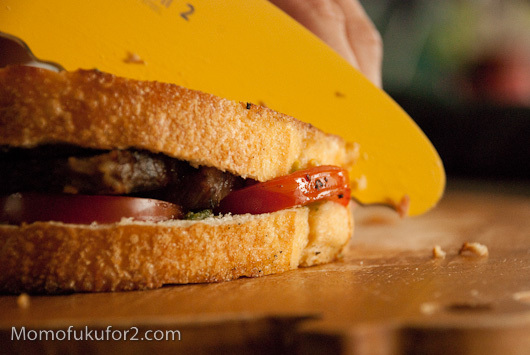 In the past I had a love-hate relationship with sandwiches. As a kid, I thought they were the nastiest invention ever – especially the ones my mom made for lunch when she was running low on time. 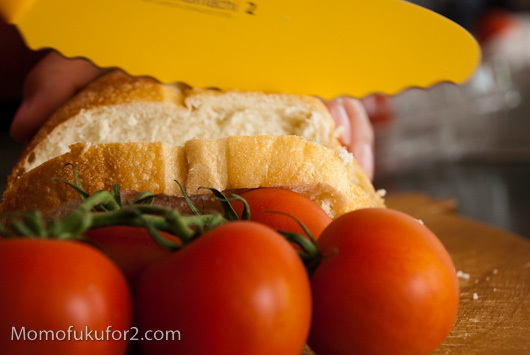 Those sandwiches were only sandwiches in the technical sense: two slices of white bread, mayo and a slice of baloney. I’m not a huge fan of mayonnaise in the best of times, so having to eat warm mayo-based sandwiches usually meant that I didn’t eat at all. I did like two sandwiches growing up: grilled cheese and peanut butter and jelly. 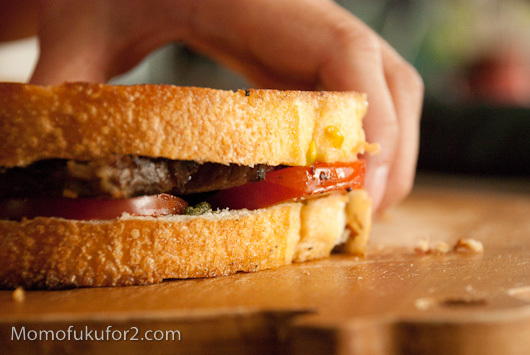 It wasn’t until I was an adult that I discovered the joy of sandwiches with delicious, well-paired ingredients. Seriously, sandwiches are the perfect food: if you make them properly, every bite is perfectly balanced! 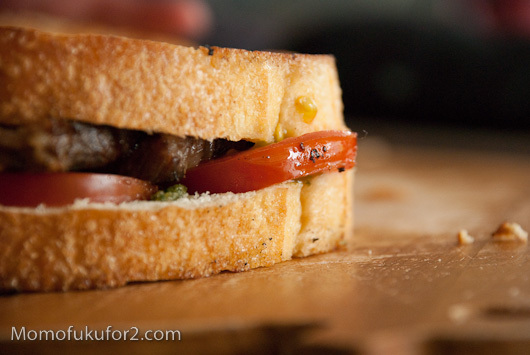 This tomato pesto sandwich is awesome. 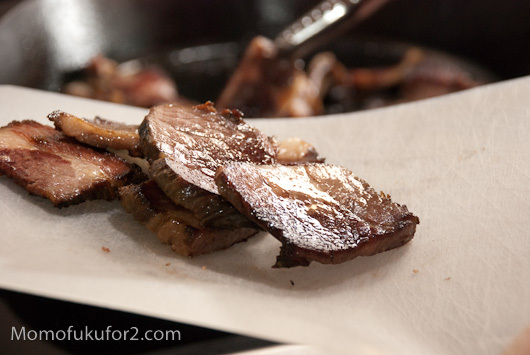 I sliced up some leftover 48 hour short ribs and pan-fried them for a bit in a cast iron skillet for a bit of char. 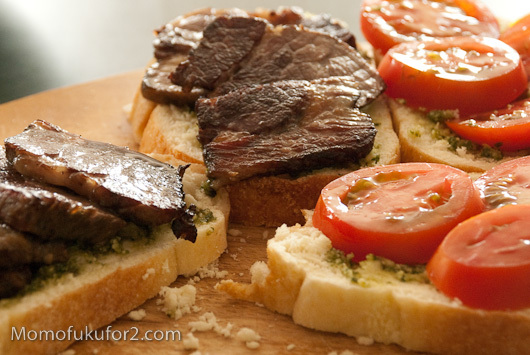 The ribs were tender, sweet and the perfect foil for the juicy tomatoes and rich pesto. 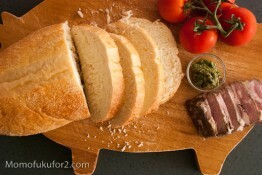 If you don’t have any short ribs on hand, substitute roast beef; tomatoes, beef and pesto go great together. If you happen to have left over short ribs, pan fry them for a bit in a cast iron pan over medium low heat. The ribs will start to brown and warm through. Remove from the pan and reserve the drippings. 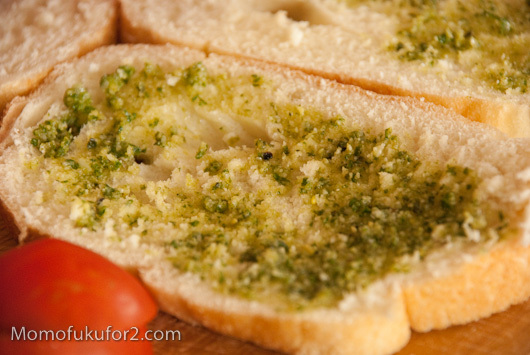 Spread pesto to taste on both slices of bread. Layer the tomatoes on one side and the meat on the other. Put together and back into the pan with the drippings. 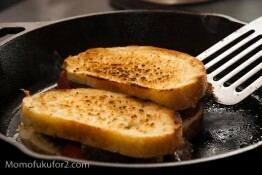 Toast on medium heat until crisp, then flip. Enjoy hot! If you’re making this sandwich with roast beef, just use a tiny bit of butter on the outsides of the bread slices and pan-fry as above. Otherwise, if you want to be a bit healthier, toast in your toaster oven.